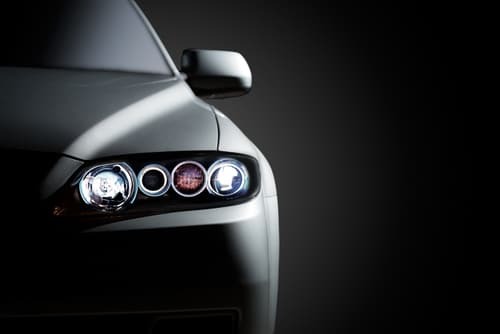 With winter in full swing, you need your headlights now more than ever. From longer nights to a higher frequency of stormy weather during the day, you don’t want to be caught with even one headlight burned out during the winter months. But headlights are only two of your car’s many, many lights. From exterior lights that help you see and be seen to interior lights to dashboard alerts, you rely more on vehicle lighting than you realize. Learn more about the often overlooked electrical system in your car to save money and ensure safety on the road. How many bulbs does the average car have? While the number of lights varies based on the car’s make, model and age, most vehicles today have more light bulbs than a Christmas tree! Bulbs are everywhere, with some high-end vehicles featuring 100 LED bulbs in the rear of the car alone. How long do car light bulbs last? Bulb life varies depending on the quality of the bulb and how much you use it. That’s why it’s important to inspect your car regularly for burned out bulbs and change them as soon as possible. Looking for a convenient way to check your car’s light bulbs? Ask your Scott’s Fort Collins Auto & Repair technician for a courtesy light system check each time you bring your car in for service. If a bulb is out, we’ll let you know and offer to change the bulb right then and there. How many cars drive with burned out lights? Exterior bulbs are the most important for safety on the road. One in three cars has a burned out headlight, turn signal or break light – and you could be one of them. Take notice when people honk or blink their lights at you for seemingly no reason. They might just be rude, but they might also be trying to tell you one of your lights is burned out. If the turn signal indicator on your dashboard blinks faster than normal, this indicates either the front or rear turn signal is burned out. Not all cars have this feature though, so be sure to still inspect your lights periodically. What causes lights to burn out prematurely? If you feel like one or more bulbs are burning out more often than they should, there could be condensation buildup inside the bulb casing. During your lighting system inspection at Scott’s, we can check for condensation and recommend replacing a tail or headlight assembly to help prolong the new bulb’s life. You might also have an alternator problem. This component, which sends power to electrical parts of your car and creates a current to recharge the battery, could result in poor light functionality or frequent bulb replacement if it’s performing poorly. We recommend you bring your car to Scott’s for an electrical system check every spring to remedy any problems. Other than replacing burned out bulbs, what else can I do to stay safe on the road? Keep your headlights, tail lights and turn signals relatively clean at all times. When scraping snow off your car in the winter, be sure to brush snow off these lights as well. Aim your headlights properly, since poor aim can blind oncoming traffic and reduce your ability to see the road at night. If there’s any question whether you should have your lights on, turn them on. Even if you can see without them, your headlights make it easier for other drivers to see you at twilight or during a storm. Take advantage of a free light system check at Scott’s Fort Collins Auto & Repair. Stop in today! You can also schedule an appointment online or call ahead at (970) 682-4202.